The Hacked Off campaign against tabloid journalists’ excesses is working on plans for legal regulation of newspapers, according to one of its members – with severe hazards for titles that refuse to sign up. Campaign member Kevin Marsh said that newspapers outside the proposed system would be in ‘a very cold, hostile place’, with no public interest defence and hefty penalties for those that went too far. 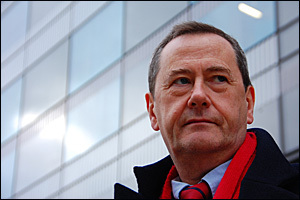 The former editor of the BBC’s Today programme revealed the plans in a lecture at Coventry University today (24 November 2011), in which he spoke of his ‘rage’ at testimony given to the Leveson Inquiry. He said: ‘The phone-hacking scandal has done no more than bring to a head the boil we know had been festering for years. ‘We need a new legal framework for the media, especially the press. We can’t even assume any more that common human decency will restrain them. ‘British media law is a mess. There’s a hotchpotch of laws. Libel, Privacy, the Data Protection Act, the Freedom of Information Act, the Official Secrets Act, the Bribery Act, the Contempt of Court Act. Dozens of them. ‘We need a clear body of law that applies to journalism. And we need to ensure that all the laws that apply specifically to journalism have a clear, public interest defence. ‘Second, we need rapid, low-cost resolution of disputes with newspapers. ‘We have any number of legal models from the small claims court to professional arbitration panels to draw on. The body of law is clearly there. And we should limit costs and potential damages in these cases. ‘Newspapers would have to decide whether they were in, or whether they were out of this system. ‘Inside, there’d also be a much stricter editors’ code, enforced with real sanctions and administered by a totally independent, statutorily established regulator with the powers and people to investigate. ‘Outside, well you could do what you liked – much as the tabloids do now. ‘Except for this. Outside would be very, very cold, hostile place to be. ‘You would have no public interest defence; costs and damages would be unlimited if you lost an action; juries and judges would be invited to take into account your decision not to sign up to the stricter code. Marsh said the Hacked Off campaign group was refining its proposals and planned to present them to Lord Leveson towards the end of his inquiry hearings. ‘Anger, offence and vindictiveness are its default settings. Kevin Marsh was founding editor of the BBC College of Journalism. He left the corporation this year and is now working on a book. Read a full transcript of his lecture here.